The conversion of the Proconsul refers to the Roman Lucius Sergius Paulus who Barnabas and Paul were intent on converting to Christianity. 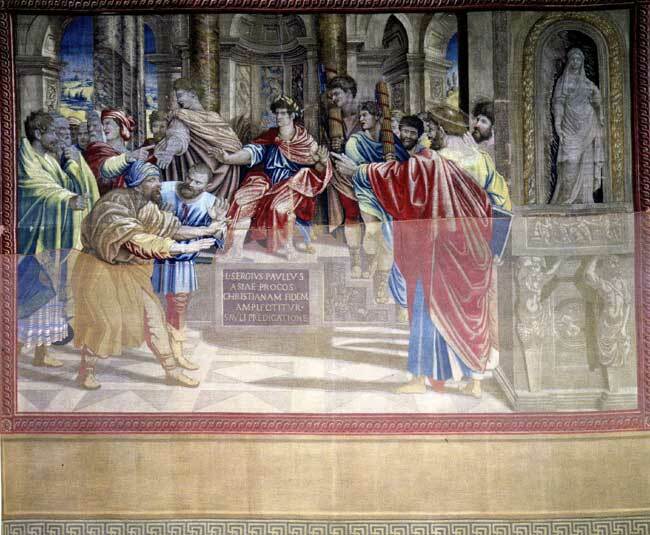 In the centre of the painting Lucius, the Proconsul of Asia sits on a throne and wears a toga and laurel wreath as symbols of his authority as an administrator of justice over his people. 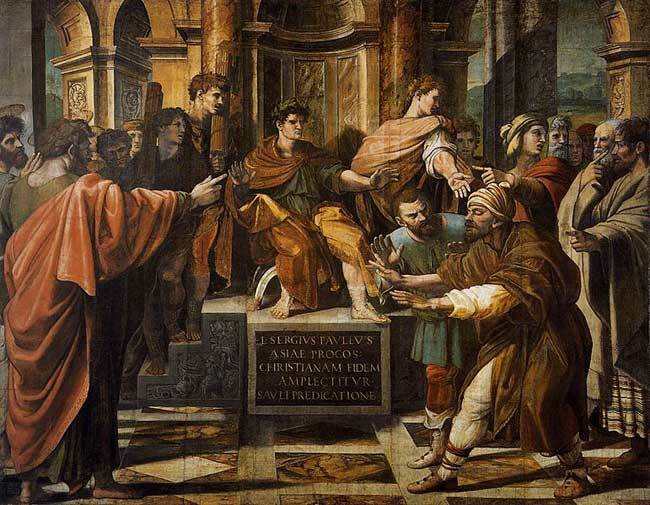 Paul is on the extreme left of the cartoon, hand outstretched as he performs his first miracle among the Gentiles. The sorcerer Elymas was conspiring against the conversion of the Proconsul and was struck blind by Paul. Elymas is shown on the right of the cartoon, arms outstretched and wearing the clothing of a barbarian, he staggers forward in his blind confusion. Only a few of the heads have been painted by Raphael, (notably those of Paul and Barnabas), the remaining figures were completed by members of Raphael's workshop. The inscription on the plinth below the throne reads; 'Lucius Sergius Paulus, Proconsul of Asia, embraces the Christian faith through the preaching of Paul'. In the Tapestry a section has been added to the original plan incorporating a female statue in a niche beyond the figures of Paul and Barnabas. It was one of the seven tapestries displayed in the Sistine Chapel on 26th December 1519.